These days, anime seems to follow a set pattern. If you have a successful series, you follow it up with a recap film. Most of the time, these films have something new in them—new footage, new characters, a new side story—but not Yamato 2199. It is completely unnecessary in every conceivable way. Last year I reviewed the 26-episode anime series Yamato 2199. As a series, it succeeded on nearly every level. It took one of the classic 70s anime, Space Battleship Yamato (called Starblazers in the West), and brought it to a new generation by adding new characters, a deeper story, and stunning visuals. The film adds absolutely nothing to this; instead, it takes away much of what made the anime so excellent. Yamato 2199: The Voyage of Reminiscence clocks in at about two and a half hours. As the full series is around nine and a half hours in length, this means nearly three-fourths of the story ended up on the cutting room floor. What's left is only the most bare-bones version of the overall story, tied together by occasional bouts of narration. The characters lack any and all development; they never evolve in any meaningful way and their backstories are never mentioned (unless they are a vital part of the main plot). While some anime recap movies I have reviewed in the past have benefited from a few cuts here or there, that is not the case for Yamato 2199. When it comes to the story, it is a pale shadow of the series' epic space opera goodness. The makers of most recap movies I have reviewed before have attempted to keep their films interesting by adding something new to the mix. The Anohana movie had a prologue and epilogue added to it; and Macross FB7—terrible though it was—at least had a lot of new content in the form of the Macross Frontier characters watching Macross 7. Yamato 2199 adds practically nothing. The only new content I noticed in the film were the still frame sketches during the ending credits and the trailer for December's new Yamato 2199 film—one which will be completely new in terms of content. So as I left the theater, I felt like I had just spent $15 to see a trailer I could have seen online for free. However, recap anime movies are able to draw in viewers for one other reason: a chance for fans to see their favorite characters and scenes on the big screen and in higher quality. 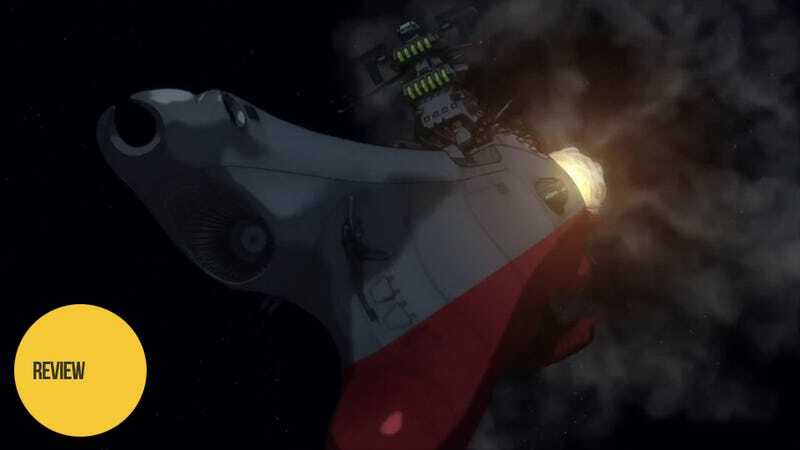 However, there is one major problem for that argument when it comes to Yamato 2199: In order to avoid many of the costs that come from airing an anime on TV, Yamato 2199 was originally released in theaters—much like Gundam Unicorn and Ghost in the Shell: Arise. Moreover, the quality of the art in the original release was already amazing and was left more or less untouched for this film. All in all, while I have seen some terrible anime recap films in the past, Yamato 2199: The Voyage of Reminiscence is easily the worst. Its cuts kill the very soul of the piece and make the characters that inhabit it purely one-dimensional. The lack of any meaningful new content makes it boring and, when adding in the fact that the series originally ran in theaters, you have a film that is completely unnecessary on every conceivable level. If you have never seen Yamato 2199 and are interested in watching one of the best space operas in the past decade, be sure to pick up the series; but likewise make sure to avoid this film at all costs. Yamato 2199: The Voyage of Reminiscence was released in Japanese theaters on October 11, 2014. There is currently no word on a Western release.